The PLU sticker system was originally developed to make check-out and inventory control easier for grocers. Instead of carrying dozens of constantly-changing fruit/vegetable prices in their heads, cashiers could simply key the sticker number into the register---et voila! You would be charged the correct price. The stickers have a four- or five-digit number that identifies the particular fruit or vegetable. 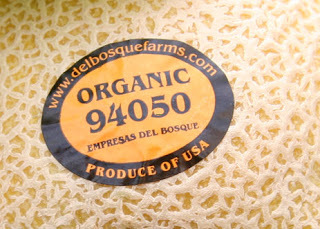 A four-digit number represents traditionally-grown produce, whereas organically-grown produce gets a five-digit number starting with the number 9. For example, the sticker on a conventional Granny Smith apple will bear the four numbers 4139, while an organic Granny will be labeled 94139. There's also a third, little-used PLU option. A five-digit number beginning with an 8 indicates that the produce you’re holding in your hand is genetically modified. This option was dreamed up years back when industry insiders assumed that consumers would accept genetically-modified (GM) fruits and vegetables. We haven't, and grocers have thus not been in a rush to identify produce as being GM. That doesn't mean we're not consuming it. Currently, up to 45% of U.S. corn is genetically engineered, as is 85% of soybeans. Estimates are that 70-75% of processed foods on supermarket shelves---from soda to soup, crackers to condiments---contain genetically engineered ingredients. This past June, the Center for Food Safety delivered more than 20,000 individual comments to the USDA demanding that the agency strengthen oversight of GM crops to prevent contamination. Read more on this topic. Vote for Top "Local Food" City in the U. S.